Louis Rooney in Linfield colours after signing a one-year deal with the Windsor Park side. 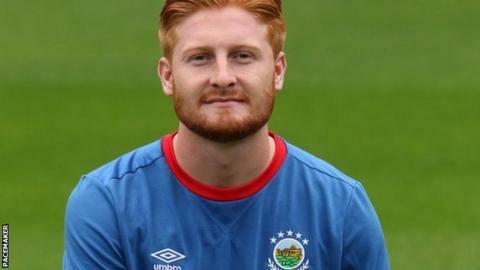 Linfield have signed striker Louis Rooney from Plymouth Argyle as they prepare for Saturday's Premiership game against Ballymena United. The Northern Ireland U21 player, who had loan spells at Truro and Hartlepool United, joins on a one-year deal. The champions have won all three league matches while Ballymena are coming off a 6-1 hammering by Glenavon. Crusaders are also aiming to bounce back from a defeat in the north Belfast derby with Cliftonville at Solitude. The Crues were beaten 2-1 by Coleraine last Saturday while the Reds drew 1-1 at Ballinamallard United. "It will take very little motivation from me to get the players up for this one," said Cliftonville boss Barry Gray. "We came off the Mallards game relatively positively while Crusaders came off their game in a negative manner - we'll just see how it plays out on Saturday." Rooney, 20, boosts Linfield's attacking options with number one forward Andrew Waterworth sidelined by injury. "Louis has been training with us in recent times and his signing will increase the level of competition for places within the squad," said Blues boss David Healy. "I'm looking forward to working with him over the coming months and I know our supporters will also give him a warm welcome to the club." Healy believes his side will have to be at their best to overcome Ballymena at Windsor Park. "Ballymena were a top-six side last season and they won the League Cup - they'll get the respect they deserve," he added. "Sometimes when you get beaten you are looking for a reaction so we will have to be on-song, that's for sure."